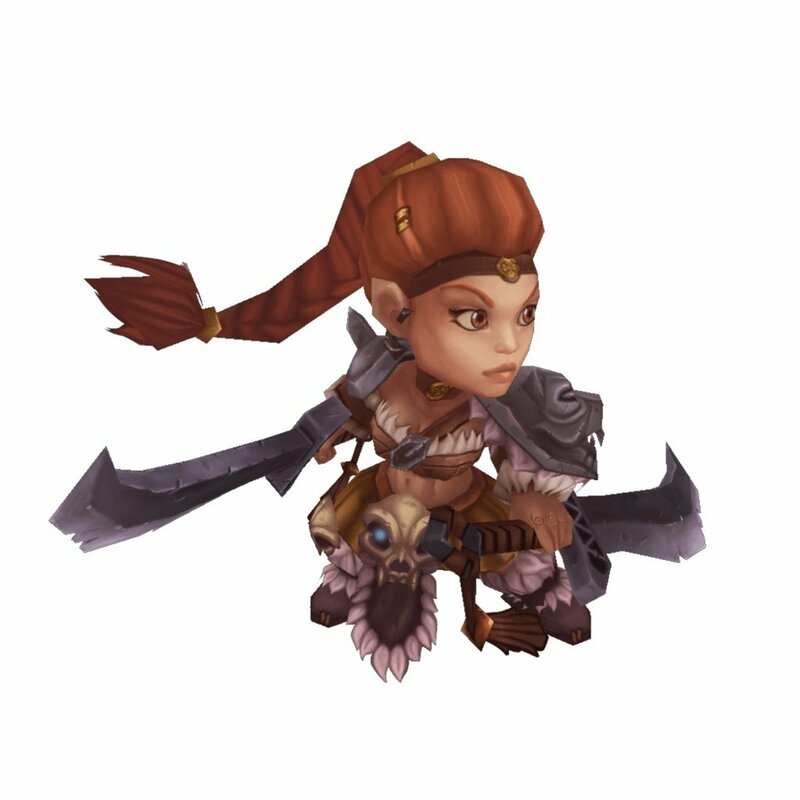 Seekers is what I've decided to call my little, work in progress, ARPG / Roguelite game! The general idea being that each of the player characters is seeking something, that their motivation for adventure is different. Whilst don't expect to be putting much narrative into the game, I think it's helpful to have lore to help guide development whether or not you directly show it to the player. As I alluded in my previous posts, this is intended as something of a practice project, trying to find something that falls into the "able to make", the "want to make" and the "want to play" categories (reference). My intended approach is to make the minimum possible that constitutes a game and then add features and improvements for as long as the project holds my interest and / or there is interest from others. In order to try and generate said interest from others, to allow players to help guide development and to figure out if anyone wants to play this kind of game, I going to be making work in progress builds publically available as soon as I have that minimum viable game. As for what that minimum viable game entails, I'm currently thinking a single playable character and a single level that takes a few minutes to play through, ending in a boss battle. As there has been some interest on twitter, I also plan to write blog posts outlining the major systems I've built that help me make this game as a solo developer. Thus far those are the animation system using the Playables API, the code driven timelines I use to create abilities for players and enemies, and the trigger / receiver system I use for 'scripting' events in the level. However as I tackle new features, say Boss AI or level creation I'm quite likely to make more! As text only blog posts seem to be out of fashion, this is a gif of me testing the trigger / receiver system by spawning enemies when the player interacts with an object, and yes the main character interacts with things by hitting them. In the first half of this year in my spare time I was working on the pixel perfect renderer and the multiplayer top down shooter, as well as doing a little pixel art. At work I was lucky enough to be leading a small team prototyping a multiplayer mobile action RPG, in the style of non-stop knight (but with more permanence and boss fights amongst other changes). The original idea being that your character would move and perform basic attacks without prompting and you would trigger special attacks. 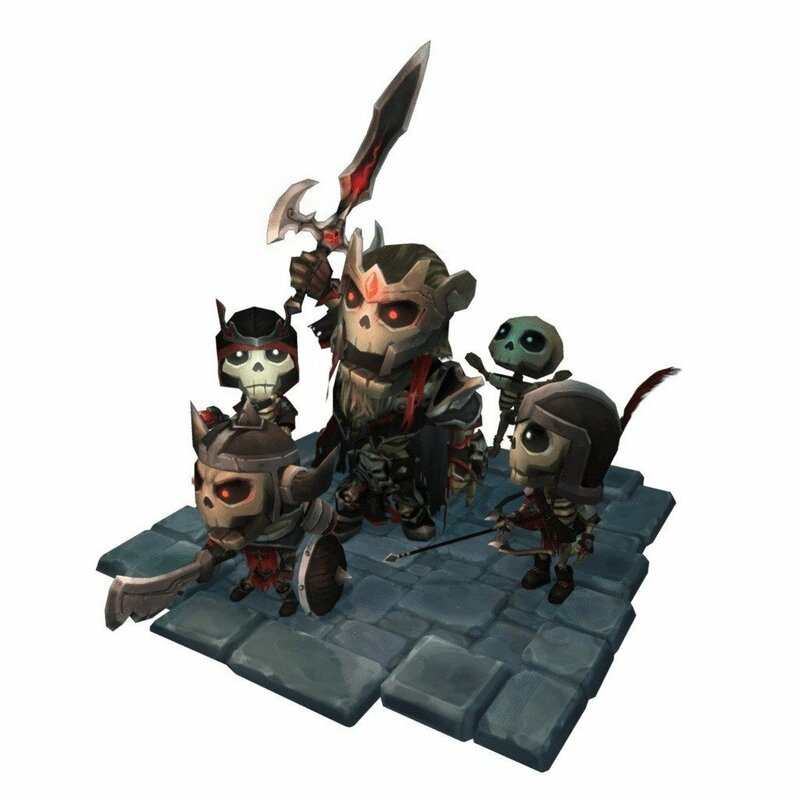 We couldn't get publishers to bite, so we moved towards no automation more inline with classic ARPGs and mobile MOBAs (like Mobile Legends: Bang Bang), which did result in a much more compelling game but the publisher we were in talks with already had a similar game so declined to take up full production, so sadly the project was put on ice. During this time I played a number of mobile ARPGs as research, in addition to the above HIT is an interesting example that is halfway between idle and full control, which once I understood the meta game I spent a fair bit of time on. Before this point I'd always avoided trying to make an ARPG myself because I found Torchlight and Diablo 3 on PC quite frustrating, the click to move and click to attack often causing lots of unintentional behaviour. I had assumed that in order for me happy when creating a ARPG I would need to make a full 8-way movement with independent aiming - Battlerite and Wizards of Legend are excellent examples of this done well. With no animation experience myself - and not knowing any animators - doing in this in 3D could be prohibitively expensive in either creation time or purchases costs of animation. If I was going to take that on, why not create a top down shooter or first person shooter which are genres I enjoy more? However having played these mobile games during my research and more recently Diablo 3 on switch, I've been convinced that making aiming and attack independent inputs was enough to radically improve the gameplay experience without needing independent facing and movement directions. Having not yet had my fill of creating ARPGs, I decided I would make an ARPG myself. As part of the prototyping process at work I was able to work with some assets that I had been eyeing for a while on the asset store, and from that I knew they would make a good basis for the game. I figured that using these asset sets as a purposeful constraint on the game design would help keep the scope manageable. So I did a little shopping at the BitGem store. I then set about reimplementing from scratch a variation of the data driven skill system we created at work. That system was engineered to allow designers to use a content management system to create and tweak character skills / abilities independently from art and animation assets, this allowed for rapid prototyping and iteration and it also had the additional benefit of resulting in a smaller (if somewhat harder to debug) code base. It's an approach with quite a lot of benefits and whilst I don't have my own personal CMS it's relatively easy to use Scriptable Objects in Unity to create a similar configuration system. Working on this - as yet untitled - mobile ARPG has been my main personal project in the second half of the year (along with the recode of this website). It's been fun to focus on making the most of assets I've bought and creating tooling and systems which suit my needs as a solo developer. Focusing on visuals early and explicitly targeting mobile has also meant I've been able to look at systems in Unity I've not used before like the Playables API and light probes / lightmapping. There's a particular game design I've had in the back of my head for a few years now. 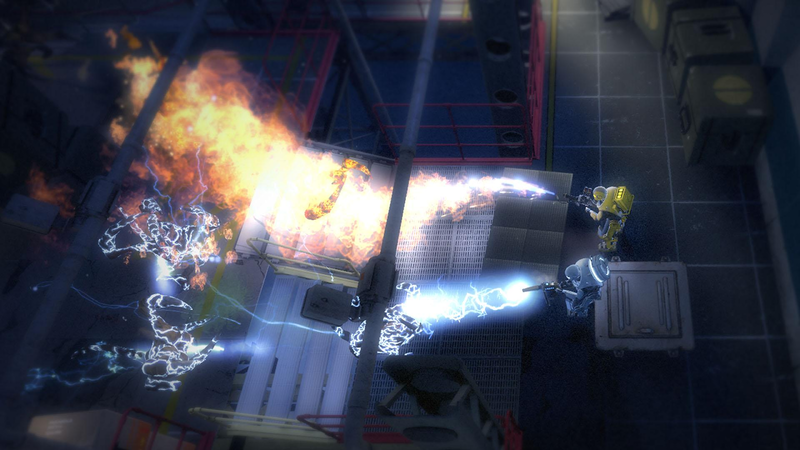 A sci-fi cooperative shooter. Originally the idea was mash up of Left4Dead and Phantasy Star Online. Valve's cooperative shooter was the first time I'd seen a game so successfully engender team work, and was still a very immersive experience. The 'AI director' tech meant it took a lot longer before it was the norm to game the systems. 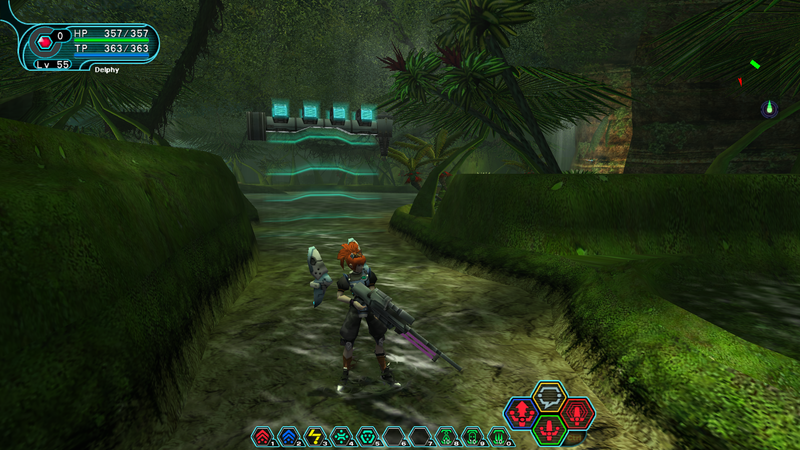 I played PSO on the Dreamcast a few years earlier, and enjoyed the world, particularly the first few levels, the aesthetic and the space opera feel of the main story, even if the mechanics were a little clunky. Sometime after playing L4D I found Alien Swarm , a free top down shooter from Valve with a strong 'Aliens' vibe, it seemed to incorporate similar swarming logic in it's enemies along with class specific mini-games. The fact it had classes and was a softer coop made it naturally closer to PSO, and yet still had the high skill ceiling / potential for mastery of the first person shooter which PSO had lacked. So the design shifted to being closer to a mash up between Alien Swarm and Phantasy Star Online. A quick aside, you can still play both Alien Swarm and Phantasy Star Online for free, and I would recommend doing so! Replaying Phantasy Star Online has been an interesting experience for me, the story and tropes employed in the side quests are quite dated and some are kind of problematic and whilst it suffers less than a lot of even modern shooters and MMOs, it does have some *ehem* interesting choices for some of the female characters costume designs. That said whilst the story hasn't aged well, I feel the mechanics and cadence of combat are far more compelling than I gave them credit for when I played as a teenager, that was probably the then Counter-Strike player thinking anything that wasn't twitch / reaction based wasn't really testing skill, although admittedly I still love twitch based games. Having spent quite a lot of my spare time over the last few years making game prototypes, but not this one as I felt it was too ambitious to achieve, I decided it was time to try anyway, perhaps part of the issue with my difficultly finishing projects was I was focusing too much on what I thought I could achieve versus what I actually wanted to make. After creating a placeholder player that turned to face your cursor with slight delay out of a pair of cubes (the top cube looking at the aim point gives a surprising amount of character to it), I followed and adapted a FPS UNet tutorial to set up basic networking - client hosted with an authoritative host - which was surprisingly easy to get working. The tutorial did seem to want you to write almost every script as a network aware script but I ended up moving towards having a single script per character to relay messages and commands with individual components focusing on their own responsibility. 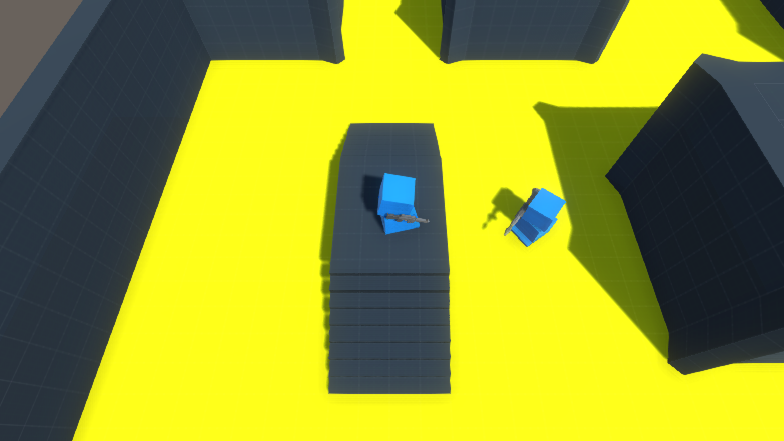 I created a test level out of Unity's prototyping geometry, and a basic system for spawning enemies who seek the nearest player and deal damage in a cone in front of them. 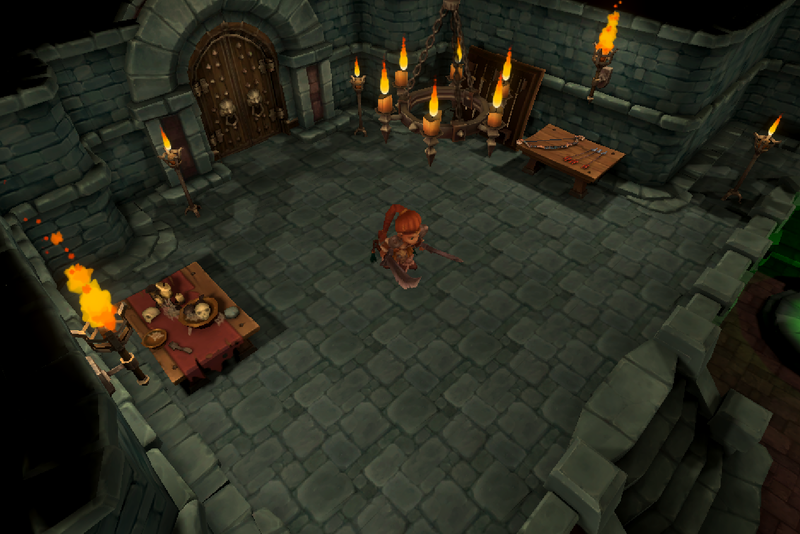 Once all enemies in an area were killed the doors would unlock and the player could continue. At this point I discovered that UNet's high level API does prediction and interpolation for you on Network Transforms that have a character controller component on but not for other Networked Transforms, it turns out you can avoid having to write your own by attaching that component on non-host clients. I also proved out a few different weapon types (burst fire, mini-guns, grenade launchers) and bought a humanoid 8-way run with independent aim animation set and got that working with characters who's movement is not controlled by root movement of the animations. Using the animation root movement may look good, but generally feels unresponsive which isn't really what you want in a top down shooter. This all sounds like solid progress right? Well quite, but then it got to the point of needing to take another pass on the enemies, which were not intended to be classically humanoid. At least point quite how much I had been relying on what I already knew how to do, or could buy off the asset store became clear. So I stopped to take stock, it had been a few months of spare time at this point. I was quite happy with the prototype as a prototype, it was quite clear the progress was going to slow down significantly as I would have to either skill up or bring in other people to help and if I was serious about trying to make this it was going to be years. As you can guess from this being a retrospective, I wasn't quite ready to commit to that and was worried that skilling up on this project that I cared about so much would compromise it's quality, and previous attempts to form a team to make a game had resulted in drama and bad feelings and being in a lead role for client development in work at the time I didn't feel like doing something that looked even more like day job during my spare time as well. This lead me onto my current Unity project, which I'll talk a bit more about in a future post - but it embraces reliance on pre-built assets, and should allow me to practice the polish (and you know finishing a game) aspects of game development, as well as getting to make features I've not created before but would be relevant to this game as well, say like character customisation. I was making all this in Unity 5.6 as I had a perpetual licence, and the new versions of Unity hadn't provided any killer features I felt would help the particular games I was trying to make. Over the last few months this has changed, particularly ProBuilder becoming integrated into the editor, improvements to the terrain system landing in 2018.3, and the decal system on the newly released FPS sample project are all very interesting and potentially useful to this type of project. The other major development is that UNet is being phased out, however the replacement has yet to be revealed and whilst the forum threads state it will still be possible to run p2p client hosted games it remains to be seen how straight forward this will be when the focus seems to be on providing infrastructure as a service. I'm hoping to revisit this project in future, when the new networking technology from Unity becomes available, and when I've had the opportunity to practice some of the areas of develop I don't get to focus on as much in my day job. I hope to blog about that project I'm using as a practice soon. At the start of this year I played around with PICO-8 and there were lots of things I loved about it! The focus on being a fantasy console meant that retro aesthetics of the sound, music and graphics were nicely in sync. The image memory and code character limits forced you to focus on achiveable games. The BBS system was very cute, worked well and had some of the "view source" mentality for game dev that helped me get into web dev. However there were a few things I didn't like; the small caps font in the integrated IDE I found extremely difficult to parse and switching to an external text editor broke immersive beauty of the program. Whilst the focus on character limits and low memory was encouraging for small scope games, it forced you to write very imperatively which I think is kind of bad practice and prefer writing in an event driven style, and this meant certain game types were extremely popular on the BBS (2D platformers I'm looking at you). The final thing was, I came a bit late to this particular party. I've been told by early adopters that originally it was very "anyone can make a game and publish it" but later in the lifecycle the BBS was populated by exceptional works by highly practiced devs and demo scene style proof of concepts for raytracers and other tech, very impressive but also quite intimidating. So inspired by PICO-8 and having previously tried making pixel perfect games in Unity and found it wanting, I spent most of my free time in January having a crack at making a similar set of tools as that provided by PICO-8 but with web tech instead. I was aware at the time this has been done before, but this was about learning and fun rather trying to create a competitor. The idea for my implementation was a set of tooling in which you could pick - or provide - colour pallettes and input capabilities as part of the configuration. You could stick to the SNES style d-pad plus 2 buttons, or you could go full keyboard and mouse, atari style, or anything in between. Allowing you to choose the limitations you wish to work with. As I wasn't planning to actually simulate a console, I had no plans to artifically enforce any kind of image or code memory limitations. The Canvas 2D context obeys image rendering properties, and the CSS attributes for these aren't consistent across browsers. Almost all functions on the canvas 2D context are anti-aliased, even when you've set canvas image-rendering properties to pixelated or equilivent. When you draw lines you need to use a half pixel offset to get sharp lines, or it'll blur the line across 2 pixels. Browsers do not display their window content at a 1:1 ratio, 1px in CSS is not 1px on the screen. You have to use the non-standard but prevalant window.devicePixelRatio to adjust the size of the canvas to get a precise number of screen pixels per texel. I successfully worked out a set of basic drawing methods, which could draw pixels at a specified integer scaling to screen pixels, by using a small subset of the canvas rendering functions. I then discovered that the exact pixels on canvas are accessible as a TypedArray you can directly manipulate, which this Mozilla Hacks article outlines nicely. Faced with the fact that I should probably re-write the renderer using this method instead, I realised I was spending all my time on tooling and that there was still significant work to do! Knowing that there was a game I wanted to try to make that would have probably been better in 3D anyway, I decided to shelve the project and revisit it when I felt like doing more pixel art. Now that I come to write this up - knowing that my next two projects were created using Unity3D - a pattern to the projects I attempt emerges. On some projects I write things from scratch, enjoying not being tied to a commercial package and focusing on learning. On others I take advantage of my experience in Unity to create things much more quickly and allowing me to put the majority of time into making a game rather than creating the tooling that I need to effectively make a game! I do think both approaches have merit and I enjoy doing both, and rather than cutting this out, I'm planning to revisit projects when I feel the desire to switch approach. So to allow me to easily to resume work on this project, I have uploaded it as Hestia on GitHub. I'm sorry there's no pretty pictures to go with this post, but this one didn't get past the coding stage!